Accessories : Scratch, spares box. The ZiS-5V is known as the simplified version of the ZiS-5. This ZiS-5 was, together with the GAZ trucks, the Russian equivalent of the American GMC or the British Bedford trucks. The 5V was a metal saving example comparable with the Einheitsbau used by the Germans on the Opel Blitz, amongst others. The PG 117 on the other hand is rather unknown. 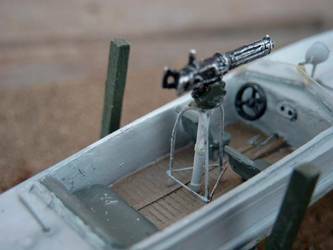 It is described in the kit as “Russian Army Sea Glider” but it is a boat and I would rather describe it as an armed launch, used by the Russians to transfer troops and material from one river bank to another. Apparently, these boats were used in Stalingrad and later at the crossings of all major rivers including the Spree in Berlin. It’s not a ferry but a motor launch used as such. All parts are packed per unit. It is obvious that AER has tried to make as many models as possible starting from their initial kit. I can only enjoy this fact because the ZiS, just like the GMC, has been used in 1001 ways. 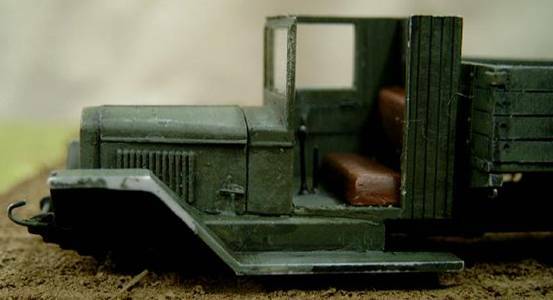 The truck uses many parts from the initial kit and also receives some new parts, as there is an extra cab front in clear plastic, which helps to solve the problem of clear glass parts for the windows. They also provide a few lengths of copper wire and vinyl tyres. The boat trailer parts come in a fragile resin but there also is a set of vinyl tyres. The PG 117 is in resin too and needs to be detailed with many scratch built parts. The biggest problem is the lack of documentation on the truck, trailer and boat. I searched the Internet but that gave no solution, even less so due to the fact that I do not speak Russian and as such am unable to check out their sites. A happy coincidence came in the form of a copy of an article from Military Modelling and a book (in Russian) about Russian vehicles but packed with a lot of pictures and scale drawings so the problem on the truck got solved. The construction plan of the kit provided the only available picture to my knowledge of a PG 117. I did build a ZiS-5V before, working with the little documentation that was in my possession at that moment. The new stuff showed me that a lot of changes had to be made to the kit parts in order to obtain a good copy of the real 5V. AER apparently just changed the cab and the fenders. The chassis comes in one piece and needs a lot of cleaning up because there is a lot of flash. As usual, AER uses this chassis for their ZiS-5, 5V and ZiS-6 and, because of this, some parts have to be cut away. The purists among us will want the replace the leaf springs too, but I decided not to bother with these. The copper wire needs to be cut in lengths in order to construct both wheel axles and the drive shaft. A torsion bar was not provided in my kit and the rims of the wheels needed to be drilled out. The bottom of an engine block, an exhaust pipe and a rear differential were provided. Two tow hooks have to be scratch built. There is a trailer and trailers need tow hooks but none are provided. The rear part of the chassis has some kind of knob that is supposed to act as one. I worked on this part by filing, sanding and cutting out a horizontal notch. I also drilled out a hole for the towing pin. If you build this one straight-from-the-box, then you obtain a berth destined to the 5 and 6 series. The 5V had a simplified version with only a movable back. The construction was simpler and our model needs to be adjusted; something that is not that simple. If you are not looking forward to the amount of work needed, well, no problem: a restored example of such a truck in Russia drives around with the cab of a 5V and the berth of a 5. I think that a lot of field restoration and changes occurred and that a mix of it all was a common sight. Cut away the hinges on both sides. Very carefully cut away the 2 supports in the middle of the sides (as well on the inside as on the outside). Try to cut them away and not to sand them off because you need them again. The 5 version had provisions to carry a canvas cover but the 5V did not (although I did see some drawings of a 5V with canvas). The parts that we cut away served as reinforcements in order to put hoops in. The 5V only had one reinforcement in the middle. One of those cut away parts needs to be glued in its new place again, on the inside and on the outside. Glue both new side panels and the rear panel on the base plate. Place a small square block in each corner between the rear and the side panels. Those panels were screwed together. Another amount of work is waiting at the movable panel. A sort of hook and rod system was used, comparable with the types that we still find on modern trailers (especially farm trailers). The hooks are mounted on the outside of the panel, the bars on both side panels. I made them from fine copper wire and some left over PE. The box cover shows a truck and trailer with boat. The rear berth is hanging down. 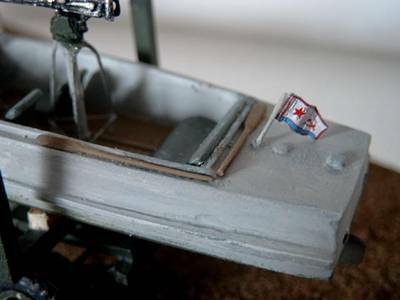 The model showed that this is quite impossible because, in reality, this berth would come to rest on the towing beam of the trailer. I think that even the Russians took time to dismount this rear berth in order to protect it from being damaged. I decided to place this berth in the cargo area. The bottom side of the floor plate receives a hook on each beam in order to attach ropes for securing cargo. The spare wheel (not provided) finds a place at the right side of the loading berth. You need to cut a piece from the central beam. On this beam comes a square plate on which the spare wheel is mounted. This square plate ends in an iron bar for which I used recovered PE. I mounted a winch in the cargo bay as an extra, which I salvaged from a Studebaker. I made some adjustments to this winch and added handles on both sides. The reason for this lies in the fact that the boat had a water displacement of 1,45 tons and I think that it will not have been that easy to take the boat out of the water without the help of a winch. I wanted to add two pillows in order to protect the bottom of the boat during transport but I didn’t see how to realise these in this scale and helped myself with a left over piece of cloth of 2 x 2 cm, which was shaped in form with the help of diluted wood glue and formed into a rectangle. I placed this at the end of the loading berth and so the boat was secured. First: the fenders. AER provides the squared type fenders but they need some adjustments below the cab doors. The raised part just at the end of the cab has to be cut away and replaced by a support made from recovered PE. I noticed, whilst studying the scale drawings of the 5V, that the windscreen came in one part instead of the 1/3 – 2/3 of the 5 type. The overhang of the cab roof was also omitted. The clear plastic parts thus needed some adaptation by cutting away this overhang. Be careful because it is very brittle. In order to give the machine a realistic look, I opted for an open door at the driver’s side. AER has forgotten to add a steering wheel; there was none in my kit. I therefore “borrowed” one from another kit. The steering shaft was made from copper wire. AER does not provide a dashboard but the curve under the window is there. I made one from scratch and also made a small instrument panel in the middle. Pedals, gear stick and handbrake were made from wire and recovered PE and were mounted on a small piece of plastic. Both doors received door handles inside and out as well as a window lever. The glass came from a recovered package. Both doors had a thicker plank on the inside just under the window. This was made from a piece of tape. Both sides of the hood needed adjusting in order to have a good fit with the radiator. It seems they also provided another hood because the three parts didn’t fit well on the cabin front; they needed adjusting. The opening for the starting crank below the radiator was drilled out. 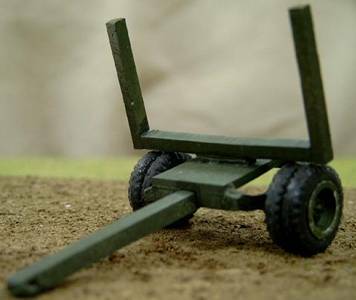 The trailer consists of vinyl tyres, plastic wheels and an axle that must be made from copper wire. The rest of the parts come in a delicate grey resin. It consists of two springs, a base plate, towing bar, a horizontal beam and two upstanding beams. I cleaned the parts very carefully but could not avoid breaking one of the upstanding beams. I guess there were some air bubbles in the resin and I replaced it with a peace of balsa. I think the Russians would rather have used wood than steel for this part. The tow bar needs to be drilled out at the front and an eye must be made from wire. 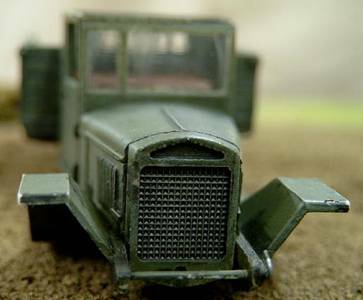 The kit suggests making this in a triangular form and it works out well but it looks unreal and so I made a round one as seen on most military trailers back then. Finally, I made two wedges from a piece of wood and glued them to the trailer as an extra. This way the boat was secured during transport. The base consists of two pieces of resin that need to be cleaned up and glued together. There are some parts loaded with flash and again a piece of copper wire from which to construct the propeller shaft but this wire is way too thick. Due to the lack of information on this type (by the time of building), I decided to place the steering wheel on the right hand side of the cockpit but careful study of the only picture available showed its place on the left side. You also need to make some sort of transmission lever that must be placed on the drive shaft housing. Holes were filled with Vallejo Plastic Putty. The more you clean up the resin parts, the more you encounter faults in the poor quality resin. The lack of information leeaves you guessing at the type or form of instruments and handles. filling up the gaps in the seams on the inside and outside of the hull. construction of a steering shaft, drilling out its hole and placement. construction of a small dashboard, placed in the middle. construction of a transmission lever, drilling out its hole in the transmission housing and placement. construction of a window, placed under an angle to the rear and two small windows on the sides. construction of a metal frame to be placed in front of the window, which serves as a mount for the searchlight, provided amongst the small resin parts. This light needs to be drilled out, to be painted silver on the interior and to finally receive a drop of Kristal Klear as glass. construction of a metal frame for the two front seats. drilling out a small hole on the rear deck in order to receive a small flagpole made from metal wire. Construction of a flag made from lead sheet (wine bottle) and decals. drilling out both exhaust pipes situated in the rear part of the hull. scratch build construction of a tri-pod mount for the Maxim gun and placement in the middle of the boat just behind the front seats. construction of a propeller shaft and adjustment of this shaft on the parts that are provided, like the shaft holder, the propeller and the rudder. mounting of a small plastic disk on top of the front bollard on the forward deck. This way it will be possible to add a piece of rope around it. drilling out of the four air inlets on top of the engine deck. Most of the smaller parts broke, due to the poor quality of the resin. The rudder was usable but the propeller was changed for one coming from the HMS Devonshire (Airfix 1/600). The shaft holder literally disintegrated and was replaced by a piece of plastic strip and some strips of Tamiya tape. I taped these strips carefully around the propeller shaft and glued this to the piece of plastic. The Maxim gun broke in three parts and could not be repaired. I had to look for another one, white metal this time, in order to replace it. As an extra, I opted for a roll of rope on the front deck and two oars coming from the spares box, which I added to the side and rear deck. I also added a piece of rope running from the front bollard trough one of the eyes and secured to the winch in the back of the truck. I used Vallejo acryl paint for the first time. The main reason for this lies in the fact that Humbrol has deleted its Russian green. Vallejo paint needs to be diluted with water and for this reason I needed to buy some other colours too, in particular black, sand and white. Besides the normal Russian green as main colour, I mixed green + black for pre-shading and weathering as well as green + sand and green + white for dry brushing. Spray painting gives no problems; the paint even does not need to be diluted. A problem resulted afterwards in the fact that the paint loosened up on some places when taking the model in hand. It also intended to draw together in droplets, which left some parts unpainted. I heard about this problem in many articles concerning the use of such a kind of paint and it occurs that it is a negative effect of water-diluted paints. It can be helped with the adding of a second coat or some local repainting. I think I will use a primer next time I use it. Other colours on the model are leather for the seats and rust for the exhaust. The engine block receives black; the tyres are in black vinyl. The headlight is drilled out, receives silver on the inside and a drop of Kristal Klear as glass. The winch receives Dark Green, the cable Gun Metal. This one got a primer followed by a cote of Medium Sea Grey. 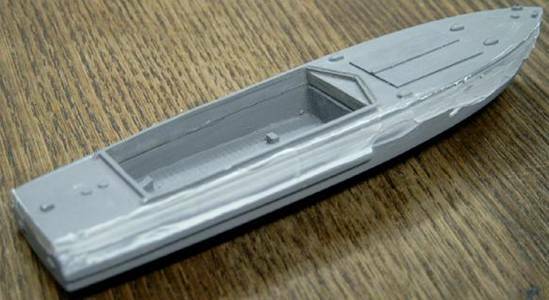 The kit provides two colour options, one for a light grey – dark grey camouflage and one for a total light grey boat. I opted for the last one but added a drop of black to the grey, a bit darker than the picture on the cover. I sprayed it very thin in order to give the boat a used appearance. I do not think that the Russians took much time to keep their material in optimal condition. The bottom received Hull Red, the propeller Brass. Both exhausts got a pinch of black. The inner bottom received wood colour and a wash, the tri-pod grey with touches of a graphite pencil. The Maxim gun got Gun Metal. According to the box art, the truck only receives a number on both doors and the boat only the marking PG-117 on the hull. A decal sheet is provided but it carries the name “BM-13 Katyusha”, another AER kit. This sheet does not provide the truck number or the markings for the PG-117. The truck received another number from the range but the marking PG in Russian script needed to be handmade. I helped myself with a sheet of press-through letters. 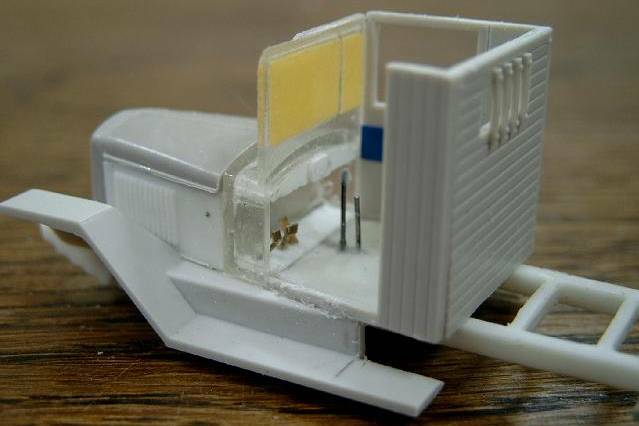 A very unusual kit and, to my knowledge, the only kit with a truck + boat combination in 1/72 of all nationalities. 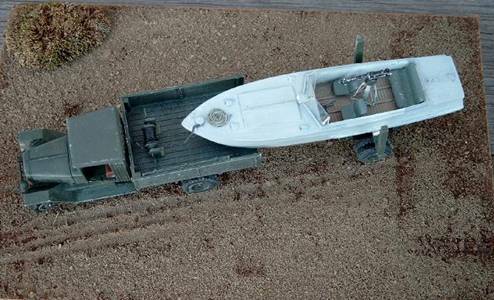 You best regard this truck kit as a multi -media kit, the trailer and boat as resin kits on which you have to add a lot of detail from various sources if you want to obtain some sort of finish. Remember that the resin is very brittle and that many pieces need rebuilding. Certainly not recommended as a first project.